We have used the SANTORO®'s Willow embossing folder for our paper piercing tutorial as a centre piece to our card and it is creative way of adding precise pierced holes to your projects. 1. Cut the SANTORO®'s Willow burgundy paper to 14.6cm x 14.7cm. Use a ruler as a guide around the edge of the paper to piece. Give a 0.4cm gap between each hole. Once you have finished piecing the paper, stick to the centre of the 6” x 6” kraft card with double sided tape. Tip: Use a piece of folded Dovecraft foam under the paper when piecing the paper. 2. Cut a contrasting SANTORO®'s Willow paper into a 12cm square, again piecing around the edge. Stick to the top left of the card at an angle. 3. Cut a piece of the kraft card to fit in the SANTORO®'s Willow embossing folder and emboss. Place the embossed cardstock onto the foam and piece the bottom half of the paper following the line of the embossed pattern. Cut along the edge of the embossing at the bottom of the folder to create a decorative scalloped edge. 4. Die cut a small cog with the pink striped paper and one with the burgundy paper. Stick the striped cog under the top left of the embossed paper and stick the burgundy cog to under the top left of the distressed cream paper. Using the striped paper, die cut a large cog and stick to the bottom right of the kraft card. 5. Die cut a flower with textured cardstock and a large cog with striped pink paper. Cut two paper blossoms in half and layer on top of each other. Add the die cut flower and the cog on top of the blossoms and then stick under the embossed card on the left side. Stick the embossed card and embellishment to the centre of the card at an angle. 6. Add the other halves of the paper blossoms under a character topper and then layer on top left of the embossed card. 7. Die cut two large and four small cogs in various SANTORO®'s Willow papers. Piece the edges of the large cogs. Layer one small die cut cog to one large cog with a foam square and add to the embossed paper where you have started piercing it. With another small cog, glue to the centre of the other large cog and add to the card with a foam square. Add the other two small cogs to paper, one with glue and one with a foam square to add further dimension. 8. 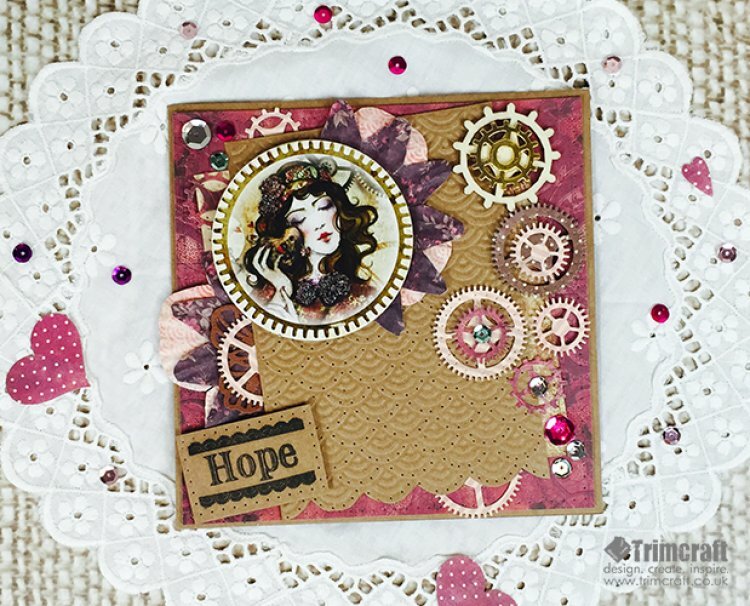 To add texture, we have added a wooden cog to the top right of the card and layered with a metal cog charm. 9. To decorate, add three sequins to the top left and bottom right of the card in a scattered effect. Add two sequins to the centre of two small cogs. 10. To finish, stamp the sentiment ‘Hope’ and cut to size, we have then pierced the edge of the card and added to the bottom left of the card at an angle with foam squares. Have you ever tried paper piercing with your papercraft projects? We would love to see them, simply add them into the project gallery.